Some ideas just refuse to go away: trickle-down economics, the bolo tie, couscous. Add to this the space elevator. If you're not familiar with the space elevator, perhaps you've heard it referred to by one of its other names: the bean stalk, the orbital tether, the nonsynchronous orbital skyhook. No? Well never mind, because unlike the bolo tie, it doesn't exist. And unlike the tie too, it probably never will  not in this lifetime at least. But don't tell Google that. The space elevator has been back in the news lately because of tech-world buzz that Google X  the secret Skunk Works where the company that gave us great doodles, a good Web browser and so-so e-mail  has included it on its list of what-if technologies it's trying to help develop. That's cool news, and it made for cool quotes, with the New York Times referring dreamily to Google's "100 shoot-for-the-stars ideas" and the Irish Times predicting confidently that "the space elevator may well replace rockets in 50 years." Maybe, but here's an important hint for aspiring futurists: "within 50 years" is almost always geek-speak for "Like, um, never?" Here's why. The space elevator is exactly what its name says it is: a long cable anchored at one end to the ground and at the other end high in space, protruding from the planet like a spoke in a rotating orange. Just attach an elevator car, hit the up button, and you can climb easily into the sky. When you get to the orbital altitude you want, open the door (don't forget your helmet!) and hop out. The idea is simple  indeed, so simple that it was first proposed in 1895, when Russian rocket scientist Konstantin Tsiolkovsky, the philosopher father of such later greats as Robert Goddard and Sergei Korolyev, envisioned a giant tower linked to a "celestial castle" that would allow easy access to the then unreachable cosmos. Tsiolkovsky's first mistake was recommending a rigid, fixed tower instead of a cable, since it would have to support its considerable weight from below as opposed to simply being lowered from above. But that was just the beginning of the construction challenges. In order for the castle, or orbital counterweight, to remain stationary relative to the rotating earth, it would have to be located 22,238 miles (35,790 km) in space  or about 10% of the distance to the moon  where the time it takes to complete a single orbit matches the 24 hours it takes the Earth to turn. In low Earth orbit, say 220 miles (355 km) up, where most human space travel takes place, a single circuit is completed in a much brisker 90 minutes. Nanotubes are actually quite nifty in principle  molecular strands of carbon molecules arranged in hexagonal configurations that are made up of much more empty space than mass. This makes them incredibly strong and incredibly light, and they've already been manufactured in strands with a length-to-diameter ratio of 132 million to one. That means they're very, very long relative to their girth, so a 22,000-mile (35,400 km) cable should be a snap, right? Well, no. Remember, the girth we're talking about is on the molecular scale. The longest carbon-nanotube fiber ever manufactured is just 8 to 12 in. (20 to 30 cm) long. So we've still got a little knitting to do. Then, of course, there's the physics. There are a whole lot of reasons Newton trumps Google on this one, but let's concentrate just on the Coriolis effect. You know what this is even if you don't, simply because you have an intuitive sense of how the physical world works. In the case of space elevators, the Coriolis effect dictates that an object higher up on the cable will move a whole lot faster than an object that's lower, even if they take exactly the same amount of time to complete a single rotation. Why? Picture a phonograph album. (An album. A phonograph album. Sigh. Google it.) A standard album turns at about 33.3 revolutions per minute, or one revolution per 1.8 seconds. That's true of any point on the album, whether it's near the center or way out at the perimeter. Of course, out at the perimeter of the 16-in. (40 cm) diameter disk, the circumference is much larger  about 50 in. (127 cm)  than it is at a point near the center, where the diameter is, say, 3 in. (7.5 cm) and the circumference is 9.4 in. (24 cm). So the point on the edge must rotate much faster to cover that 50 in. in 1.8 seconds than the point near the center, which has to cover less than a fifth of the distance in the same time. Want proof of the difference in speed? Imagine turning up the record's revolutions per minute to 45, which was the r.p.m. for a single. (A single. Never mind.) Now put a penny somewhere on the label near the center. The album will spin, but the penny won't budge. Move it out to the perimeter, however, and the increased speed will cause the penny to be flung away. Neat, huh  but not so neat when it comes to space elevators. Since the lower regions of the cable are moving slower than the higher ones, a rising car will lag behind the orbiting anchor, causing a drag on the cable that could destabilize the entire assembly. For Newtonian reasons so complex they'd make your head hurt, you can dampen this effect by moving your orbital anchor higher, up to 62,000 miles (100,000 km) above the ground, which puts us a wee bit further still from the 11 in. (28 cm) of nanotube we've got so far. Add to these a few other wrinkles  the requirement that you build your earth-based anchor somewhere on the equator and preferably at sea, so you can maneuver it out of the way of storms, as well as manipulate the cable so it can dodge incoming space debris. In addition, the orbiting anchor would have to be exceedingly heavy to remain stable in so high an orbit, which means building massive rockets that don't yet exist to launch it in the first place. In the alternative, say theorists, we could also capture an asteroid and simply haul it into place. (Um, O.K., pardner, let us know when you've got that baby lassoed.) Finally, warn international auditors, even if you could get a working space elevator built, the price tag would be an estimated $13.6 kazillion zillion  or €10.05 kazillion zillion at today's close. 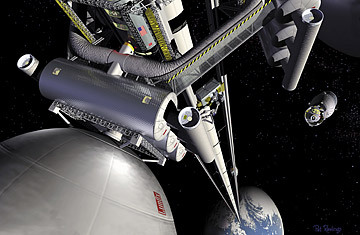 There's nothing at all wrong with puzzling out how a space elevator could get built. The puzzling part is a critical stage of all invention and inspiration. Go just one or two centuries back and almost any complex technology we accept as routine today  the Internet, air travel, probes to the outer planets, flat-screen TV  was also the stuff of fabulists. But imagining is not the same as building, and puzzling is a long, long way from patenting. So go for it, Google, and best of luck. Just don't call us till you're done. Read whether NASA will have to abandon the International Space Station. See a brief photographic history of the Hubble telescope.